For this last week of the month we are greeted by the Page of Swords, revisited by The Moon, and advised by the Eight of Staffs. The Page of Swords is bringing to light an energy of learning and training. This card reminds us to be wary of thinking we know all of the answers this week. We might think we’ve got things under control but don’t have all of the information or understanding of the situation. Though you may feel comfortable in your position, there is still much to learn and many ways you can grow. You must put in the work before you can reap the benefits but don’t try to skip the hard stuff, it’s there to teach you something useful and important. There are always areas in which we can grow. The Moon has stopped by once more. This time it is to bring our attention to the first quarter moon we will have this week. 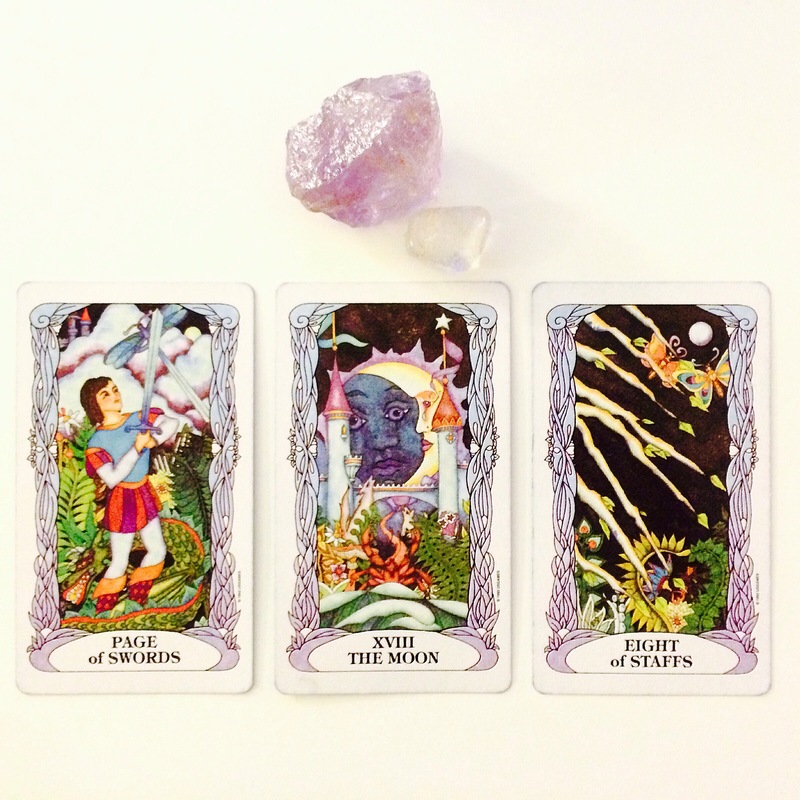 As the Page reminds us to put in the hard work and learn what we can, the Moon tells us to plant seeds now and we will see growth. The first quarter moon is an excellent time to build and put energy into the things you are passionate about. You have become aware of your fears and the things that hold you back but you are not letting them stop you. Rather, this week you will be able to surpass your fears and turn that energy into new endeavors and a time of reflection. Look inside yourself for the strength to get things done. This week we are advised by the Eight of Staffs. Things might seem a little scary this week as starting new projects, learning, and growing can be intimidating. You will have to make decisions about which direction you want to go with certain aspects of the week. This card shows a need to delineate between what your heart is telling you and what your head is telling you. It might seem as though everyone around you is telling you to one thing or another but use what you have learned so far and follow your own instincts.